Just when we thought we were getting ahead of schedule, we realized we had [briefly] forgot the Gemäldegalerie. No, it doesn’t mean Old Gems Gallery. It means “picture gallery”. 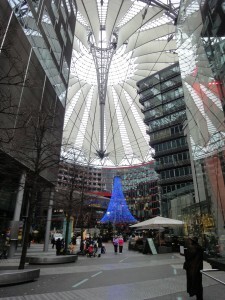 It houses the collection of medieval arts and Old Masters paintings in the newly built Kulturforum in Potsdamerplatz. Located nearby is the national library and the concert and opera halls. Within the same building are modern as well as traveling collections, which we ignored. Ron had purchased a tablet computer, the kind that has an attached keyboard and re-orients itself depending on how you hold it. On this, he was able to go online and find the bus route we would need; he took a photo with his cell and used that to get us to the bus stop. The bus pulled up just as we got to the stop. We, of course, had exact change, thanks to the bus website. Traveling with a tech-savvy engineer compulsive type is so sweet.. Walking to the museum, we crossed through the Sony Center, a bland name for an enormous, multi-story shopper-tainment complex. It is covered with a transparent ‘floating’ roof, but it is not really an enclosed mall. In the center space workmen were erecting an elaborate set for the European premiere of the 2nd Hobbit movie. 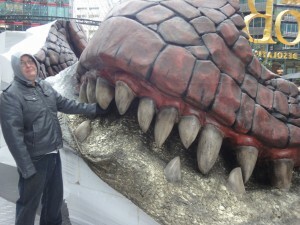 No one was around, so Ron stuck his hand in the dragon’s mouth. Cool. Scattered about were large scale Lego statuary, such as a life-sized giraffe and a ½ scale Santa. The Gemäldegalerie features a collection of works from the 13th to the 18th century. 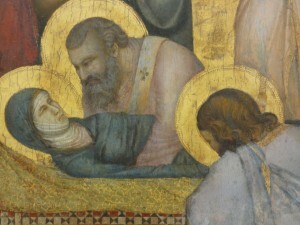 It possesses the finest collection of late medieval paintings we have seen anywhere. Many were parts of altars, sadly disassembled, but, thank God, not destroyed during the Protestant / Catholic wars. The colors so vibrant and alive; the scenes so beautifully depicted; the faith so unshakeable. That having been said, however, one can only look at so many Marie und Kind [Mary and Child with various entourages] and Johannes die Taub [John the Baptist, with and without his head] before the eyes glaze over and the throat parches. Ron claims that I was getting snarky, but after lunch, WE felt much better and resumed our tour. We had a remarkable macaroni soufflé with spinach and ham mixed in. The very best museum dining rooms in the world serve some form of macaroni and cheese, and that is ok with me. Also we had an vinaigrette / oily salad of cukes, carrots and cabbage, with fennel [almost kim-chee]. This substantial lunch was quite fortunate, as they closed the kitchen in the afternoon, so all we could get was drinks from a vending machine. Among the wonders: “The Dutch Proverbs” illustrated by Pieter Bruegel the Elder; “The Entombment of Mary” by Giotto; Jan van Eyck’s “Madonna in the Church”; two Madonna paintings by Sandro Botticelli; numerous Rembrandts and Rubens. 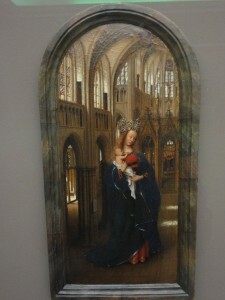 But for Old Masters, this museum beats anything, including The Hermitage! Whenever we went on a trip, we asked Andrew and Simon if they wanted anything from that given place. Simon would always reply, “Bring me the head of John the Baptist.” We would always photographs those paintings in his honor. 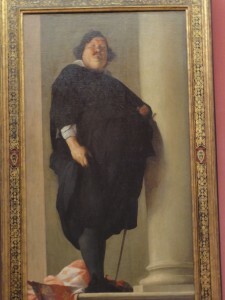 But this time, there was a “portrait” of Simon himself! * Sando is Japanese for sandwich.